Amacon is proud to be one of twelve developers to have a highrise selected for the UDI / Vancouver Sun Readers’ Choice Award, representing the Best Highrise in this year’s UDI Awards of Excellence. Aptly named, the design objectives for Modern were centred around the need to create a building as desirable as its location. Situated precisely where downtown meets the West End at the corner of Harwood and Burrard Streets, Modern’s architectural design needed to integrate into Vancouver’s established West End neighbourhood while also reflecting its downtown flair. The end result is Modern, a true nod to connecting two juxtaposed communities. 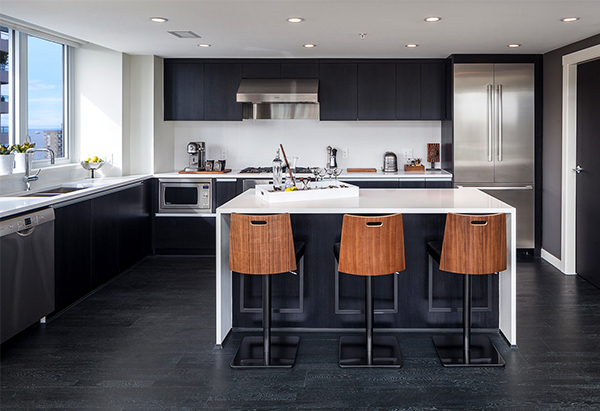 Working closely with the astute IBI Vancouver team, Modern was designed as two forms. The north side (closer to downtown and the cultural hub of Davie Street) reflected a more playful and vibrant, colourful block form. The south elevation was defined by the striking pointed balconies and a sophisticated elevation. The top two levels of Modern capped the building with five incredibly unique and beautiful penthouses. These 2-level ‘SkyHomes’, each had a large roof-top patio. The spaces were bright, offering open glass staircases, vaulted ceilings, incredible city and English bay views, and added upgrades to the interior finishes package. From all of us at Amacon, thank you for your votes!